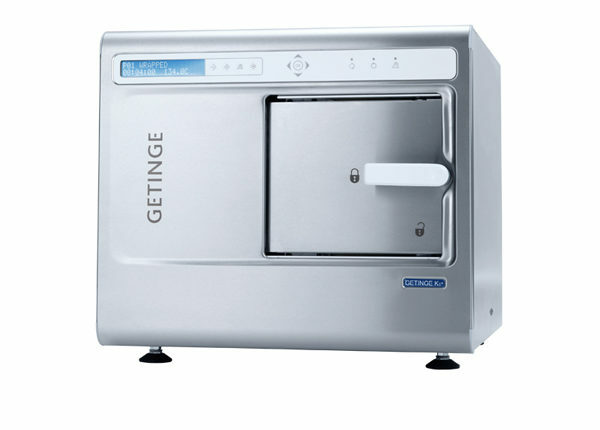 The Getinge K-Series autoclaves are exceptionally fast, high-capacity bench-top machines. In fact, one autoclave does the job of two! 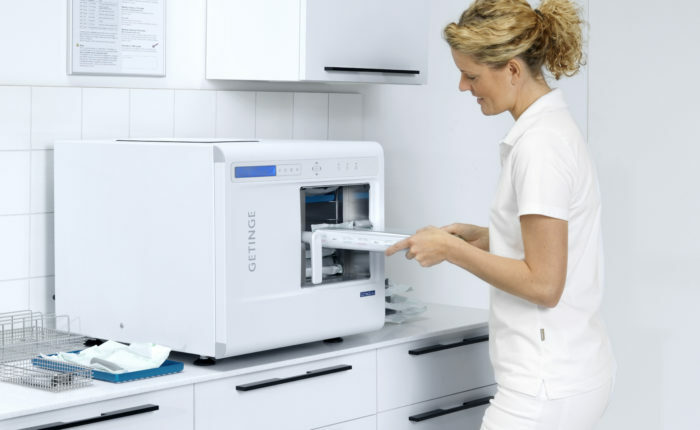 In just 25 minutes, you can sterilise up to 10 trays using the B-process program. That means 20 trays per hour. If you only need a flash program for unwrapped solid instruments, it takes a mere 9 minutes! This all means that you get your instruments back into circulation quickly, thereby sharply reducing the number of instruments your clinic requires. Renting your autoclave from CMI Healthcare Services will ensure the peace of mind that your equipment is designed to the highest standards of quality, performance and reliability. 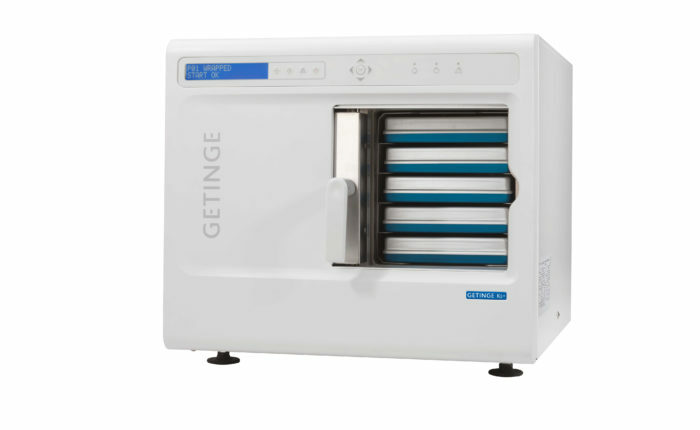 The Getinge K-Series autoclaves have a rectangular that utilises nearly 100% of the volume when sterilising trays and cassettes. In a round chamber, 25% of the volume is wasted space. The chamber volume of a bench-top autoclave in litres provides a rough picture of the loading capacity and this criteria works well as long as you compare autoclaves with the same chamber shape. However, if you compare autoclaves with different chamber shapes, the volume in litres may be misleading. The chamber shape is decisive for the loading capacity, so don’t just look at the litres, count the trays/cassettes! Autoclave Rental packages – one monthly price, no hassle, no hidden fees. When you take out an autoclave rental agreement with CMI Healthcare Services, there are no hidden charges what so ever. You will receive a brand new autoclave, installed, commissioned and user training provided as part of the package. Breakdowns, parts, servicing, annual validation to HTM01-05 and annual PVI (Pressure Vessel Inspections) are all included free of charge. 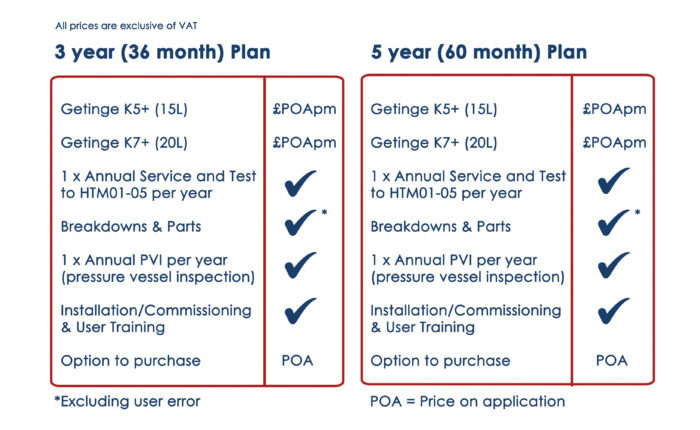 This gives you the peace of mind that your autoclave is compliant throughout the agreement and in the unlikely event that your autoclave breaks down, you won’t have to pay for an engineer to come and fix it. You can choose your autoclave to be white or stainless steel and all autoclaves are supplied with a thermal printer as standard. USB logging devices are available as an option. All our Rental Agreements are FCA Approved. Click the logo below to see our registration details. The Getinge K-Series come equipped with 8 programs as standard.